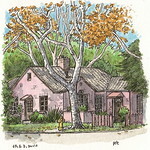 One of the more historically interesting neighbourhoods in Davis is the Bowers Addition, better known as Old North Davis. It’s an area I have to walk home through in the evenings if I have been downtown, when it is dark, subject to the local ordinances that are meant to cut down on ‘light-pollution’ – people want to see the stars, but I’m the sort of person who wants to see the guy hiding in the shadows with the knife, personally. However if you walk through this are in daytime you can really see the neighbourhood for what it is – pretty, historic, colourful and full of places that would be great to sketch. 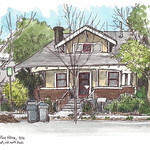 Recently I have made it my mission to draw as many historic (especially pre-1917) buildings in Davis as possible, and since the Old North is also now over 100 years old, I’ve added a bit more of it to my sketchbook pages. My inspiration has long been an excellent book by local historian John Lofland, “Old North Davis” (amazon link), which I picked up several years ago at the University bookstore. In the book, Lofland details every single block, between B and G, and 5th and 7th, with the history of most of the buildings, along with many photos both historic and taken by the author. It’s quite a spectacular undertaking. But anyway, let’s dive into some of my own sketches of the Old North. The panoramic one at the top was sketched at 6th and E, and was one of those ones where I added only the bright Springtime colors, so that they would stand out a bit more, and left the left-hand details unfinished. Also because I was sneezing uncontrollably and just could not draw any more. The house itself is a dark blue and looks great against those colors (especially the touches of pink) but you’ll have to take my word for it. It’s so floral around here on a Spring day, despite all the sneezes. The “Bowers Addition to the City of Davisville” (as it was called; Davisville wasn’t formally a city, and would be called Davis when it was) was created in 1913 and named after its lead developer, C.W.Bowers. 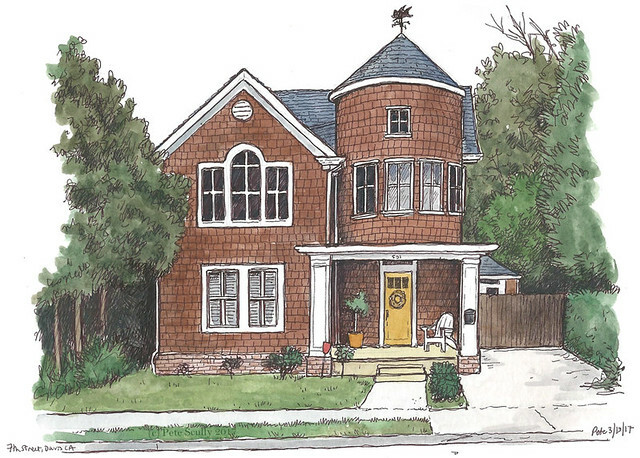 The house above, also sketched in spite of the allergies, was one of those original houses, being built in 1913 in the 600 block of E Street. 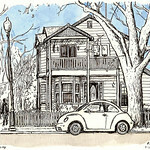 It is on that list of historic Davis buildings on the City of Davis website, called the Liggett House. 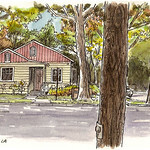 It’s on my map of pre-1917 buildings (see the previous post, “Davis before the City of Davis“). 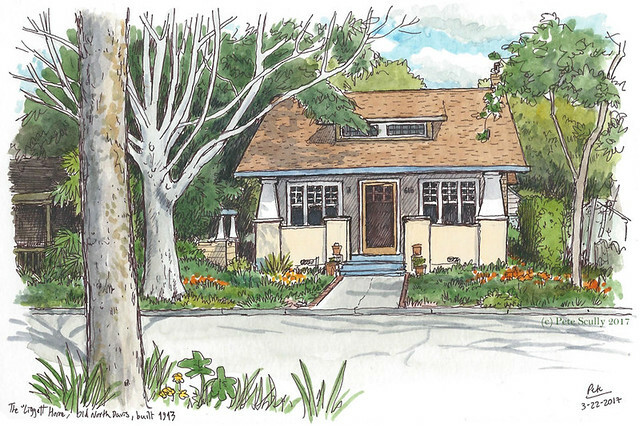 It’s a craftsman bungalow and one of the oldest unaltered homes in this area. I sat on a bench across the street in the little spot called the ‘Lyda Williams Memorial Garden’. Lyda Williams was a resident of this street who once had a magnificent flower garden, according to Lofland’s book. It is a very pretty little spot to sit and dream, or in my case, sketch. 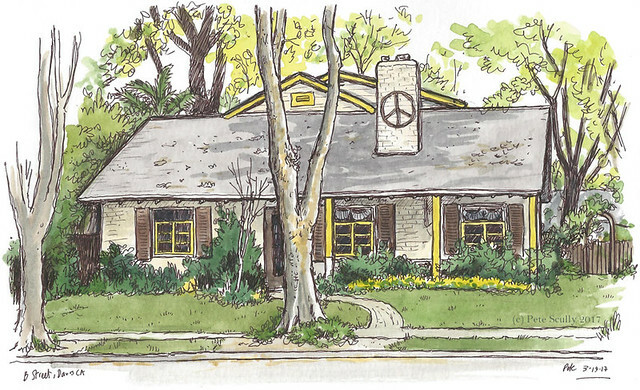 This house on B Street has always been one I’ve wanted to sketch (though there are a few around here with the peace symbol on I’ve wanted to draw, because it makes it feel that bit more ‘Davis’). 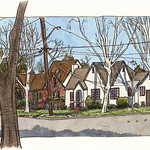 I was out on a Sunday having a little Old North Davis solo-sketchcrawl, before the sneezes start.This is around the part of B Street that is slightly crooked in relation to the other streets in the grid. I’ve always liked cycling past this large and unusually shaped house, imagining it some kind of castle, though it is more like the Silo and has a fun weather-vane on the top (I cannot make out the shape, but it looks like a flying pig). I had to give up before I was done with this and finish off at home because the sneezes and itching eyes took over.I went to Lofland’s book to see what I could discover about the history of this magnificent building, but the photo of the house at this address..looked nothing like this one. Well, his book was written in 1999, I came to Davis in 2005 (and north Davis in 2012), so perhaps that older house is now gone (it’s funny, I find I don’t want to suggest ‘demolished’ or ‘torn down’ or even ‘vanished’, I’m trying to find gentler words, as if the house has, well, passed on to the next life). This one is much less aged-looking, and very clean and well-kept, so must just be a lot newer. 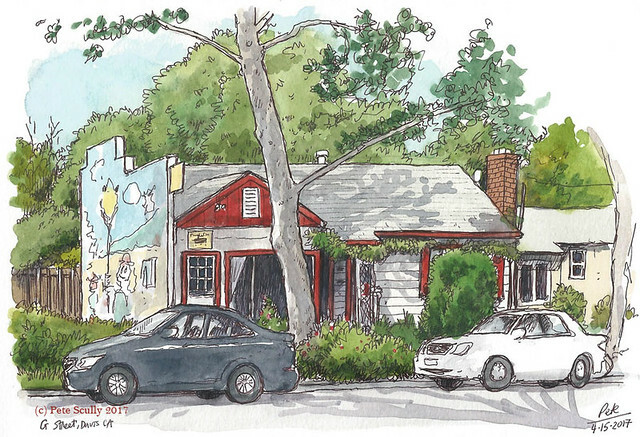 This was was drawn just last week, a colourful little place on G Street which isn’t a residence as far as I know, but a place called ‘Tangles Studio’, which must be something to do with hair. I keep my hair super short so I don’t worry about tangles. In fact I had just got my hair cut downtown, shaved to a very close crop. There is a large mural on the side of the wall that has been there for a long time. This is an older sketch from 2014 that I wanted to include here again, because it is so interesting. It’s on the corner of F and 7th, on the edge of the Old North. Years ago F Street used to stop at 7th, but was extended beyond after World War II. 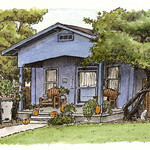 This building is known as the Anderson-Hamel House, and this is not its original location. It used to stand on the corner of F and 2nd Street, before being relocated five blocks north in the late 1940s; Lofland provides a nice photo of it in the original location downtown (p100, ‘Old North Davis’). 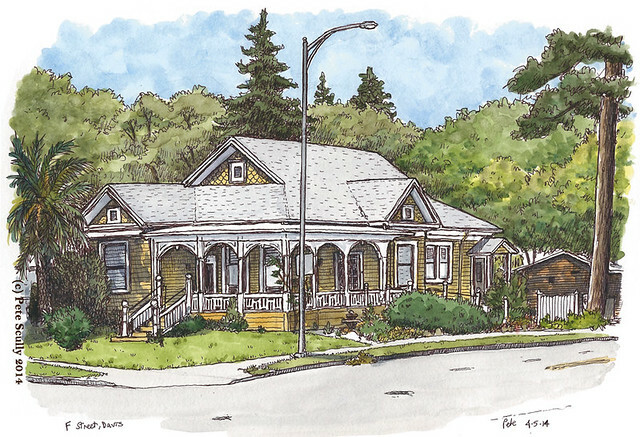 This is a ‘Queen Anne’ cottage built in 1903 by the man who became the first mayor of Davis, John B. Anderson. He also ran the Davisville Cash Store. It was sold to the Hamel family in 1923, and then again to the Quessenbury family, who moved it out here so they could build a drugstore on the original downtown location. This house has a dentist’s surgery now. This is an amazing collection of old historic Davis homes. One day a book…. I’m curious, how long does it take you to do one sketch? Depends on how much time I have; I usually sketch in my lunchtime so it has to fit within an hour. Often if I haven’t the time to add all the colour on site I’ll colour in later (I am much more about the penwork). Most of these were less than an hour all in all. 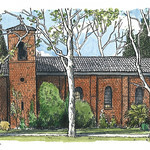 …sometimes though if I have the time, I will just sketch and sketch, and be there for two or three hours. A panorama will take between 2-4 hours. It’s good to set yourself limits but it’s also fun to just draw forever! Thank you. I’ve been doing sketches for 3 years now. But no major sketches. Just a tiny sketches. Now I’m trying to incorporate watercolor to it. 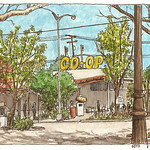 Also, I now started (little by little) doing urban sketching or sketches on places. I find it difficult to watercolor on place considering people are looking at me while doing it.